WHY DO WE WANT ARTIFICIAL FLOWERS ? 1.This is a very good home decor that will make your home full of nature and light your life. Relieve stress and relax your emotions. 2.Environmentally friendly, non-polluting, don't worry about pollen allergy (if you are allergic to pollen, and hope to have more flowers and plants at home, fake flowers will be a good idea. Some places are not allowed or suitable for raising plants,if that you can choose artificial flowers instead of living plants. 3.Fake flowers do not need to be watered and fertilized as much as living plants. You just need to put it there. Save time and effort, if you are busy at work, then this is for you. 4.It is a nice gift, you can give it to your friends and family .Such as, birthday, wedding, Valentine's Day, Mother's Day, Thanksgiving, Christmas, etc. 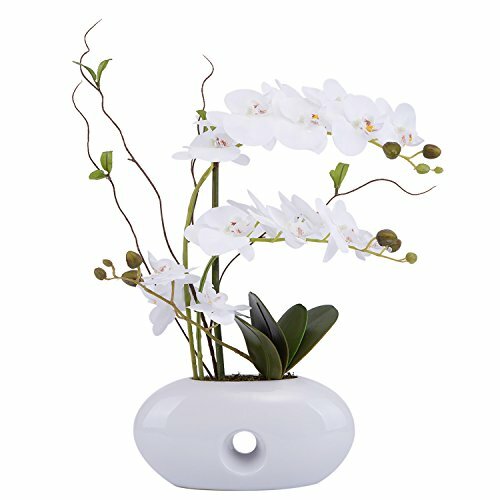 1.We have our own factory specializing in the production of fake flowers, especially orchids. Material :Petals-Silk, high-grade environmentally-friendly silk and feel like real petals. Due to there is no exact name for the color,Please Take the picture as the criterion.